HYPER-V,SYSTEM CENTER AND AZURE: Microsoft Tech-Ed New Zealand 2011 Presentation:-SIM204-What's Coming in Virtual Machine Manager 2012? 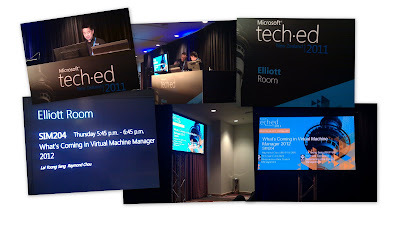 Microsoft Tech-Ed New Zealand 2011 Presentation:-SIM204-What's Coming in Virtual Machine Manager 2012? In this session, we (Raymond Chou (SCOM MVP) & Lai Yoong Seng (VM MVP) provided an overview of the new features in System Center Virtual Machine Manager 2012 which included new architecture of VMM 2012 and 4 pillar of management:- deployment, fabric, cloud and services management at Microsoft Tech-Ed New Zealand 2011 (Auckland). SIM204-What's Coming in Virtual Machine Manager 2012? SIM204-What's Coming in Virtual Machine Manager 2012? from Yoong Seng Lai on Vimeo.